A view from the top can be both exhilarating and frightening. For many chief information officers (CIOs), overseeing their organizations’ transition to ICD-10 can feel much the same. Most agree that the sooner the initiative becomes a primary focus, the better chance there is of enjoying the view come the deadline of October 1, 2013. Chris Scanzera, CIO at AtlantiCare in Atlantic City, New Jersey, says the two-hospital health system approached ICD-10 as an enterprisewide initiative and not just an IT project because of the clinical, operational, and financial issues involved in the transition. Leading the initiative at AtlantiCare is a hospital-based chief financial officer (CFO) who took on the project because of its direct impact on revenue cycle and reimbursement. Scanzera sits on the ICD-10 steering committee, which features a combination of clinical, financial, and IT leadership providing input and direction. “We’ve completed our assessment and application inventory and are in the process of scheduling and upgrading systems as required,” says Scanzera, who adds that AtlantiCare would like to have everything in place sometime in the fourth quarter so it can parallel test for three quarters before going live. Bill Spooner, FCHIME, senior vice president and CIO at Sharp HealthCare in San Diego, says the healthcare system has been working on ICD-10 initiatives for approximately two years. At Sharp HealthCare, the ICD-10 task force is composed of a steering committee and strong executive sponsorship. Spooner cosponsors the steering committee with the CFO of one of the system’s larger hospitals. “We created five working groups: IT applications, healthcare planning, trading partners or other providers, clinical documentation improvement, and a combination of communication and education to spread the message. My role is to coach, to ensure there are adequate resources, and to ask enough questions to cover the bases for such a strong clinical and financial initiative,” he says. According to Spooner, the team identified 58 applications that needed to be migrated, 17 of which were designated as critical. “We put together a nice level of detail in the plan and created an escalation plan for vendors that asked them for software by March to allow for time to go through several cycles of testing and to allow for appropriate education,” he says. Based on its experience with other initiatives, Sharp HealthCare decided it would be easier to map forward from SNOMED to ICD-10 rather than backward, so it started by exploring the documentation and coding angles. 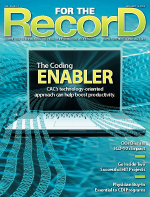 “The physicians were realistic about them not learning both systems, so we started to identify automated coding tools—for example, at the front end with physician documentation—that can populate codes that conform to ICD-10,” Spooner says. Cathy Bruno, FACHE, vice president and CIO at Eastern Maine Healthcare Systems (EMHS), started ICD-10 planning more than a year ago. Bruno serves as the project’s coexecutive sponsor along with the health system’s CFO and the chief medical officer. “This means that with the other two executive sponsors, I make sure the project has the support and resources it needs to be successful. This includes things like making sure there is an adequate budget and that additional positions are approved,” she says. To improve efficiency, the EMHS Leadership Council, which consists of the organization’s CEOs plus key corporate vice presidents, decided to combine its ICD-10 efforts with HIPAA privacy initiatives since all systems would have to be inventoried for both projects. As reported in the EMHS Leadership Council’s update, ICD-10 and HIPAA impact 100 vendor-licensed systems and 500 systems and databases built by EMHS entities using Access, SQL, and Excel. Over the next four months, the project team will take inventory of all known impacted systems, assess remediation alternatives, and recommend a specific plan for each system that requires fixes. During the same time frame, other working teams will study coder training, analyze provider documentation process change, establish an education plan, conduct a forms and report evaluation, and examine the possibility of enlisting a supplemental coding staff. Vendors have begun to release plans to deal with these changes, and project solutions are scheduled to be in place later this year or early 2013. Another factor in the transition is cost, which Scanzera likens to an unfunded mandate. “At least with meaningful use and EMR implementation, the government defers some of the cost for implementation, but for this, we have to do it, and we have to pay for it too,” he says. Much of the expense involved is related to training and support, which not only costs money but also takes practitioners away from patient care for large blocks of time. Keep in mind, Scanzera says, there will most likely be a need to increase staffing to support pretransition education as well as the actual transition when ICD-10 goes live. Like AtlantiCare, EMHS has also encountered cost issues. “Because of budgeting timing, we were asked to estimate the total cost of the ICD-10/HIPAA project before we completed the inventory. This required making assumptions and estimating. Once the inventory is completed and we have a final HIPAA rule, we will go back and refine the estimates,” says Bruno. Spooner says the changeover to ICD-10 is so comprehensive that discussions with other healthcare professionals indicate a general belief that the education and physician adoption components will overshadow the IT challenges in complexity. “I don’t ever remember having to convert 58 computer applications simultaneously, and that is the smaller part of the job,” he says. In the face of the daunting road ahead, smart organizations continue to move forward. Thus far, Bruno is satisfied with EMHS’ progress—sort of. “I will be more comfortable once the HIPAA final rules are published,” she says. At AtlantiCare, Scanzera likes the steps the organization has taken thus far but remains cautious. “Am I satisfied with the progress so far? To date, yes. Am I confident and comfortable? I am always confident, but truly it’s just too early to tell, like most any other CIO would tell you,” he says. Spooner believes Sharp HealthCare is right on target. “We expect we will be close to a coding solution [this month], then by mid-2012 see it all come together. Then we’ll take a deep breath and make the mad rush for 2013,” he says, only half-joking.